he's not obito you know...................he'UCHIHA MADARA! 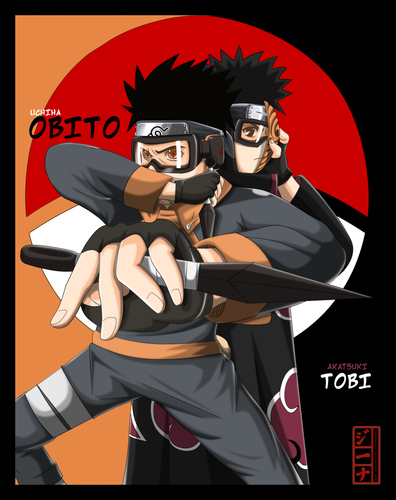 No one can say who tobi really is. If a guy with a mask says he's someone (let alone someone famous in history) who's to say this villain is telling the truth? He might be arousing fear for his advantage in the war. this is annoying...obito died, random people. Tobi is Uchiha Madara!!! GAAAAAAAAAAAAAAAHHHHHHHHHH!!!!!! plz, get ur facts right. whoever made this photo has some reading to do!! HE IS NOT OBITO OR MADARA!!! READ THE MANGA!!!! HE SAID" well just call me by my old name tobi." HE STILL COULD BE MADARA! Madara's body was revived. How many bodies has Orochimaru had.